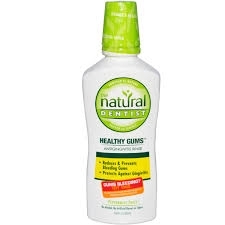 The Natural Dentist Healthy Gums Mouth Rinse is an herbal/botanical remedy that was originally formulated by a practicing dentist to treat his own patients’ gum problems. It contains a unique combination of medicinal herbs plus the time-tested therapeutic value of 20% purified Aloe vera. Importantly, also, are the things this product doesn’t contain. No alcohol. No artificial colors, flavors or preservatives. Don’t stop using it when the bleeding stops. The product is an excellent everyday mouth wash with all of the benefits (fresh breath, a cleaner mouth, etc.) that most people seek. After brushing, rinse mouth with 1 cap full of anti-gingivitis rinse.